Sold in June 2017, the 36.58 metre motor yacht Virtue is back on the market, listed for sale by Antonio Yturbe Redo and Hans Van Doornmalen at Edmiston & Company. Designed by Stefano Righini, Virtue was built in GRP by Italian yard Benetti to RINA class and delivered in 2008. A luxurious interior by Francois Zuretti accommodates 12 guests in five cabins consisting of a master suite, VIP suite, double and two twins plus two Pullman berths, all with entertainment centres, Samsung LED television screens and en suite bathroom facilities. 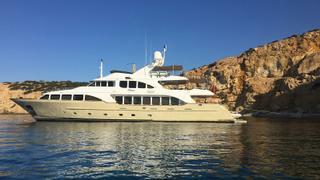 In addition, there are quarters for seven crew aboard this yacht for sale. She has an elegant saloon featuring a selection of sofas, armchairs, gold curtains and mirror inserts. The dining area forward is intimate with a large table able to seat 10 guests for gourmet meals while between the lounge and dining area is a full wet bar and entertainment system including a 46 inch Samsung LED television screen and a Denon sound system. The aft deck is equipped for al fresco entertaining and dining with built-in bench seating, a table and chairs while the sun deck has panoramic views, a Bimini top aft, a Jacuzzi, gym equipment and sun pads. Twin 2,000hp MTU diesel engines give her a cruising speed of 13.5 knots and a range of 2,200 nautical miles. For added safety and comfort, she is fitted with Naiad zero speed stabilisers. Lying in the South of France, Virtue is asking €5,950,000.